It is the stuff of nightmares for any family and for any parent. Stress and a breakdown in communication lead to a breakdown in marriage and in the family order. What order may remain in this life via the routine of child rearing is disquietly and suddenly fractured and distorted as the fabric of the family union, the child, is torn from its parents. The play focuses on familial relationships: husband and wife, mother and daughter, father and daughter and also father and son. This examination of relationships, responsibility, trust and suspicion is undertaken amidst a super-heightened emotional state and at absolute crisis point. The couple’s only child has, without warning, disappeared and in the resulting void, Cusack’s and Palmer’s characters emit illicit suspicion and little compassion. Alex Palmer’s Jack is cruel and tainted with bitterness about not bonding with his daughter as he would have with a son. His belittling of his wife, played by his real wife, Catherine Cusack, is beyond reprehensible and spiteful in the utmost, as he callously describes her as “useless” and “cut” in a derogatory sense regarding her post-caesarean body. The loss suffered by the parents, of their angel, is a consequence of the loss of stability in their own relationship. The breakdown of familial communication and love, demonstrated by the flashbacks to loving embraces on a sun-kissed Spanish beach, has had a knock-on effect on their daughter as she enduring crippling nightmares, foreboding the tragic fate to come. The confinement of the set is matched by the confinement of the nightmare which the parents endure at the loss of their child. Time loses its hold, sentences hang and remain unfinished and moods alter rapidly and more often than not, violently and threateningly. Leo Butler’s text is immensely taut, frighteningly stark in its delivery, frantic but with balance in its pacing. The story retrospectively recounts the movements of the child on the morning she disappears but even no certainty can be attributed to those ill-remembered moments and adds only to aggravated distribution of blame. A ubiquitous menace and ominous sense of frustration and grief pervades throughout the performance which often treads on the mark of unsettling. The real strength of Butler’s text lies in its reality and documentary quality but also relying on more pure theatrical elements of fictional presentation. Here, Donnacadh O’Briain, director, must be given credit as he exudes every last element of space, time, anxiety and fear from the restricted space and set and also the spot-on delivery of Palmer and Cusack. 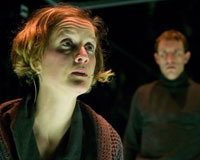 Catherine Cusack, in the role of the distraught mother, delivers a performance of such striking ability and passion, with a final monologue astutely balanced in its delivery and yet tinged with gaping rawness, it will stand as one of the great performances of this or indeed any year. The sound and score, designed and orchestrated by Philip Stewart, delivers an ambience and soundtrack that can at once force one to shiver, squirm in fear and anticipation and remain totally in tune with the cast and dialogue. The words and actions of the permanently absent child presented through the mouths and actions of the parents are simply chilling. The set, designed by takis (sic) consisting of a large Perspex box, imprisons its two inhabitants for the duration of the play. The design has Beckett-like elements that restrict the movement but not the graphic expression of the grieving and warring couple. The voyeuristic element of viewing the work through this box presents and challenges many elements of contemporary theatrical formats. It adds a dimension between the cast and audience that must be cognitively deconstructed by all parties in order to experience the heightened emotions of the parents. The play has many contemporary references with news stories of late with similar theme of loss of a child. While these references will be near impossible to avoid, the relevance of the work as a social commentary reflecting on a lack of trust in society and neighbours and breakdown of relationships and marriages owing to work and personal pressures mark the specific relevance of this intriguing and astounding piece of dramatic theatre. The Early Bird is as powerful a production that reflects in uncharacteristic ways many of the most universal of family issues and creates a forceful deconstruction of family relationships.